This child-controlled Solar Rover is ready to drive an interest in the amazing science of solar energy. Its interactive design lets your students harness the power of the sun and cast shadows to drive, turn and stop the rover. Plus, take the show on the road with the activity guide and three training course cones to create a rover challenge course. 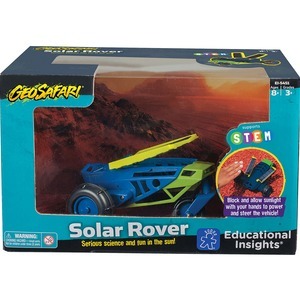 Perfect for STEM learning, this solar rover is designed for children ages 8 to 12.